MyPalletsOnline is the 1st site specialized in the supply of handling pallets and products associated with storage and handling such as Big Bags. With a range of over 300 products online, we are in 1st place of expertise on handling pallets and big bags. A team driven by passion, cumulating more than 20 years of experience, in storage and handling pallets and in classic Big Bags and also the most technical. Our team combines all its know-how to propose and advise you on the best solutions for YOU. You thus have the freedom of self-service 7/7 24/24 for the vast majority of our products or ask us for a personalized study, an estimate, and this whatever the product which we sell. We have integrated on each of our pages a "quote" button allowing you very simply to consult us, contact us via our online chat, or ask us to call you back immediately or by scheduling the day and time. Thanks to our network of locations, we are present throughout France and Europe. This presence enables us to offer you local and regional solutions for new and used wooden pallets and to deliver them within controlled deadlines. Also the relations with our manufacturing plants allow us to deliver you in optimal conditions of quality and follow-up. With the exception of new wooden pallets for which we produce to order, all our products are in stock. Tailor-made service. Our design office, equipped with all the design and strength calculation tools, can design and produce your new wooden, PVC and cardboard pallets. He can check the current use of your handling media and suggest optimizations. The widest range of pallets and big bags on the net! Each type of material in our range is directly accessible by clicking on each link below (Product Range paragraph) or by passing the mouse over the themes in the menu bar. For your convenience, we have sorted handling pallets by size range from the smallest to the largest, from quarter pallets to custom pallets and Europe 80X120 pallets. In each size class, we offer identical models in width and length with alternatives taking into account the load of your packages and determining the mechanical strength factor. Lighter, equally strong and completely dry. 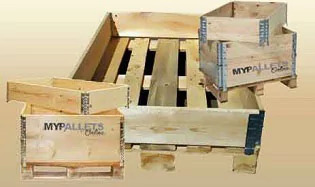 Moulded wooden pallets are ideal for exporting your products by sea and air freight. 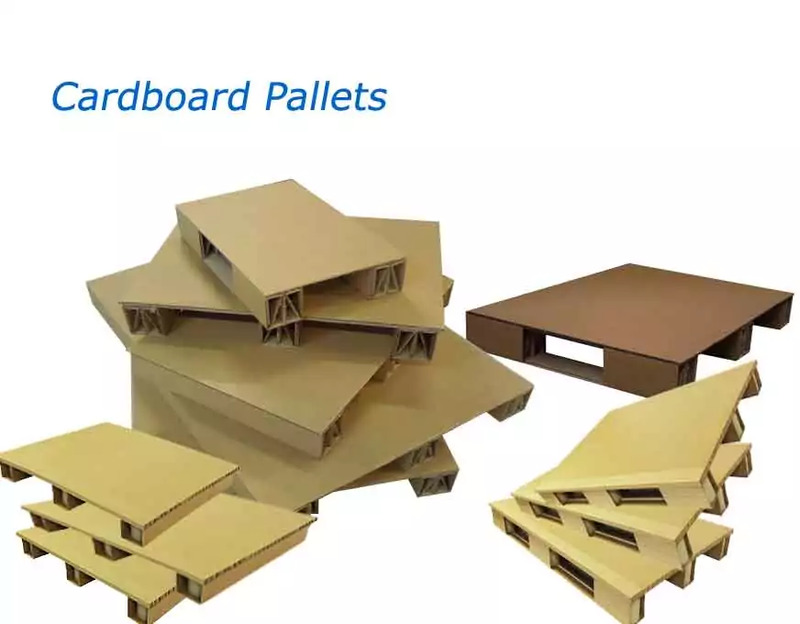 MyPalletsOnline offers a wide choice, from quarter pallet carton up to 100X120 pallet either in double and triple corrugated cardboard or in honeycomb design. The lightest pallets on the market, in one-way use, they are widely used for your displays, POS, pallet display and pallet layer when preparing your orders. With a light weight, they are ideal for your air shipments, you save a lot in transportation costs. The weight difference of up to 20kg compared to wooden pallets, you get a very important gain. Namely: Our design office designs tailor-made cardboard pallets. We study with you your needs and we propose the most optimized corrugated cardboard or honeycomb model according to the desired strength. Economic and Innovative : For the shipment of your light and bulky cartons, we have the solution with our pallet feet. Equipped with adhesive strips, Glue - Place and transform your box into a very light pallet box. We produce all new Wood pallet models, and we also design to measure after exchange on your needs and production and logistics constraints. We present you with detailed technical data sheets as well as drawings and resistances, all standard models, such as the Europe pallet, the CP pallets, or the industrial pallets (100X120). We have also created and optimized wooden pallet models with dimensions 80X120 and 100X120, "MyPalletsOnline design", allowing to reduce the material composition while maintaining the mechanical resistance qualities. This way the pallets are cheaper and just as compliant. MyPalletsOnline offers you the most used dimensions and declined according to the level of quality that you wish in 1st choice wood or standard quality wood. Standard quality wood visually implies the presence of knots but does not reduce the intrinsic properties of the extension. Info ! At your request, we can also provide you with new wooden collar inluding size for chemical pallets like 1300X1100 which adapt perfectly to the CP4 and CP7 pallets for example. Our local and regional locations enable us to offer you cheaper pallet delivery solutions. All available sizes and quality levels such as Europe 1st or 2nd choice pallets, CP or VMF pallets as well as light, medium and heavy pallets. With a range of over 150 models available, we offer the largest number of items immediately available on the market. According to the quantity you are delivered in 48 hours, in metropolitan France and 72 hours everywhere in Europe. For Individuals and Professionals, We have classified our Big Bags by preferred activity sector. We have also added an Advanced Filter (criteria) allowing you to select, from a few simple criteria, the products corresponding to your needs. With our design office, we can also design your Bulk Bags with your specifications. Find the big bag from 0.25m3 to 2m3 from the most classic to the most technical. Gravel bag or construction waste. More than 30 models are presented used in the agricultural world. For seeds, fertilizers, and for storage of all products in the sector. With Goulotte at the top and bottom in different diameters we have selected for you the most useful bigbags for your activities. For recycling waste, whether it is wood, cardboard, plastic or ferrous, we offer a wide range of solutions including powder and dust proof big bags. All our products in this range are produced in sterile rooms. They are checked individually for foreign particules. From the 250L mini big bag to the 1 m3 standard, we offer a range dedicated to private individuals. For your green gardening waste or for your do-it-yourself waste, we have the products that correspond to your needs. 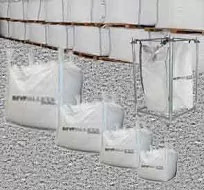 Body tipper, dump body, asbestos approved or UN (UN) certified, we offer the largest choice of large flexible bulk bags (FIBC) for containment and handling of toxic and hazardous products.